Since the midterm elections, the liberal media have been singing the praises of Democratic Minnesota Congresswoman Ilhan Omar for being one of the first Muslim women in Congress. That praise came despite Omar’s long history of trafficking in staunch anti-Semitism. On Monday, the liberal broadcast networks (ABC, CBS, and NBC) had no choice but to acknowledge her hate, but only after recent tweets from Omar forced the hand of Democratic leaders to denounce her. 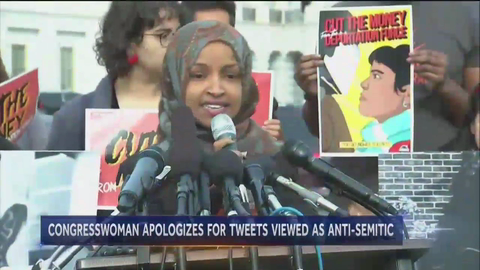 DAVID MUIR: There's about apology tonight from freshman Democratic Representative Ilhan Omar. She has, quote “unequivocally” apologized for tweets that were considered anti-Semitic. The Minnesota Congresswoman was fiercely criticized by members of both parties, including a stern rebuke from House Speaker Nancy Pelosi, after suggesting support for Israel was fueled by money from a lobbying group. This, for one of the top political news stories of the day. In contrast, both CBS Evening News and NBC Nightly News ran full stories on Omar’s anti-Semitism (2 minutes, 4 seconds and 1 minute, 35 seconds respectively).